The title comes from the first verse of the reading, which says, “Then Jacob sent messengers before him to his brother Esau in the land of Seir, the country of Edom” (Genesis 32:3 [verse 4 in Jewish-published Bibles]). Jacob prepares to meet Esau as he returns to the Promised Land, but first he has a mysterious encounter with an angel in the darkness, who changes his name to ISRAEL. The portion follows Jacob’s adventures in the land of Canaan, including the loss of his beloved wife, Rachel. Va-yish-lach Ya-a-kov mal-a-khim l’fa-nav el–E-sav a-chiv ar-tzah Se-ir s’deh E-dom. And Jacob sent messengers before him to Esau his brother unto the land of Seir, the field of Edom. Ya’akov/Jacob and Esav/Esau make up after 20 years of bitterness and hatred on Esav’s part. Praise YAH! However, let us remind ourselves again, who were Esav’s descendants? There’s Amalek (who formed the Amakelites) and Edom (who formed the Edomites) amongst others. These resolved to become Israel’s enemy for life, to-date, sadly. They chose Satan’s darkness over YAH’S LIGHT! 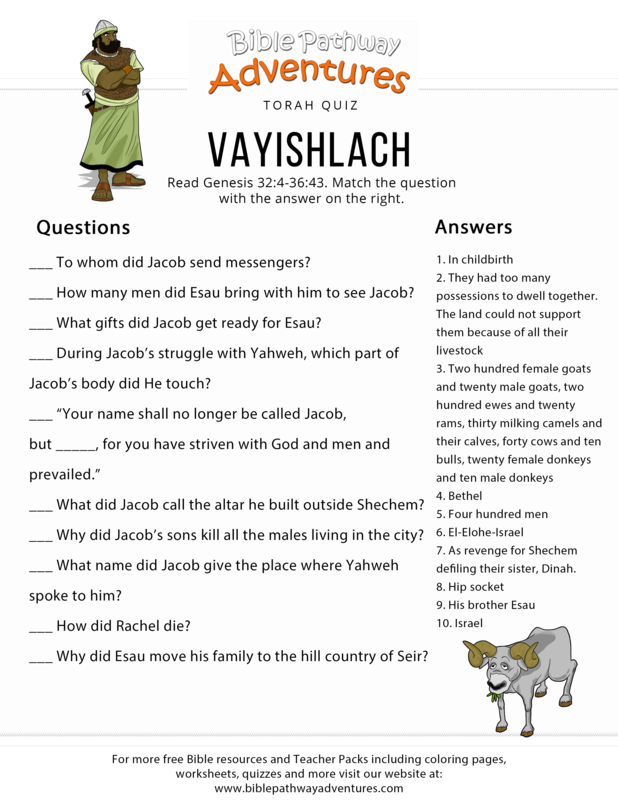 Esav and Ya’akov/Israel may be family biologically but they are no longer family spiritually! Rachel died very young and is sadly the only one who was not buried in the Holy Land, Israel (known as Canaan at the time). Ya’akov/Israel loved Rachel so very much that he took Rachel’s maid as a kinda replacement of Rachel when his beloved passed on. What Laban did in terms of tricking Ya’akov never changed his feelings towards Leah. You would think that he would have automatically turned to Leah however he did not. This really upset Reuven/Reuben, his first born. Reuven’s actions in retaliation costed him his 3 birthrights. This is all revealed in the Book of Jasher/Upright Man. This article contains a chronology of the life of Jacob. By examining passages such as Gen 11:10-32 it is apparent that the lifespan of men was decreasing at that time. Jacob lived 147 years (Gen 47:28). While his life was not as long as that of his forefathers, it is still long in comparison to the lifespan of people today. It is apparent that at that time people not only had longer lives, but also their physical condition was not deteriorating as fast as for the people of our days. As will be shown in this article, the following chronology could be stated. Jacob was about 15 years old when Abraham died. Years later, Isaac moved to Gerar. Jacob was 40 years old when his brother Esau married. When Jacob was about 77 years old, he went to Padan-aram. He was approximately 84 years old when he married. In the following seven or eight years all his children were born, excepting Benjamin who was born when he was about 104 years old. Jacob returned to the land of Canaan when he was about 97 years old. Joseph was taken to Egypt when Jacob was about 108 years old. At the age of 130, Jacob moved to Egypt, where he died 17 years later. The remaining part of this article explains this chronology. Jacob and Esau were born when Isaac was 60 years old (Gen 25:26), approximately 15 years before the death of Abraham (Gen 21:5, Gen 25:7). The fact that the lives of Abraham, Isaac, and Jacob overlapped can also be seen in Heb 11:8-9: “By faith Abraham … sojourned in the land of promise, as in a strange country, dwelling in tabernacles with Isaac and Jacob, the heirs with him of the same promise”. Now, in view of Gen 26:1, we can infer that Isaac went to Gerar after Abraham died, that is, when Jacob was more than 15 years old. Indeed, the previous passage in Gen 25:27-34 (note especially Gen 25:27) speaks of Jacob and Esau as of grown up men. Esau married when he was 40 years old (Gen 26:34). Thus, Jacob also was 40 years old at the time of Gen 26:34. The passage in which Isaac sends Jacob to Padan-aram (Gen 28) takes place later. The age of Jacob at that time could be calculated as follows. Jacob was 130 years old when he came to Egypt (Gen 47:9). As stated in Gen 47:28, Jacob died 147 years old and he lived 17 years in Egypt. Now, Joseph was 30 years old “when he stood before Pharaoh” (Gen 41:46). At that time, speaking about the matter of the years of plenty and of famine, he said that “God will shortly bring it to pass” (Gen 41:32). Thus, it is assumed here that the following year was the first year of plenty. As written in Gen 41:29-30, there were 7 years of plenty and 7 years of famine. There were 5 years of famine left when Joseph called Jacob into Egypt (Gen 45:6,11). So Joseph was about 30+7+(7-5) = 39 years old when Jacob came to Egypt at 130. So Jacob was about 91 years old when Joseph was born. As we read in Gen 37:3, Joseph was a “son of his old age”. While Benjamin was younger than Joseph, he was just a little child at the time of Gen 37:3, when Jacob regarded Joseph as a son of his old age. This will be shown later in this article. Now, after Joseph was born, Jacob asked Laban that he be allowed to leave (Gen 30:25). He did not leave at that time, but he spent a total of 20 years with Laban (Gen 31:38,41): 14 years for his wives and 6 for his sheep and cattle (Gen 31:41). The time of Gen 30:25 must be after the first 14 years. This would imply that Jacob came to Padan-aram when he was 91-14 = 77 years old. Then, this would imply that Isaac was about 137 years old at that time (Gen 25:26), which would agree with the fact that Isaac was physically weak (Gen 27:1) and that he was thought to be somewhat close to death (Gen 27:41). Note that Isaac lived 180 years (Gen 35:28). Thus, Jacob was about 120 years old when Isaac died. Joseph was about 29 years old at that time. In Gen 29:20-21 we read that “Jacob served seven years for Rachel; and they seemed unto him but a few days, for the love he had to her. And Jacob said unto Laban, Give me my wife, for my days are fulfilled, that I may go in unto her”. In view of Gen 29:20-21 it would appear that Jacob married 7 years after he came to Padan-aram. At that time he was given both Leah and Rachel (Gen 29:22-30). Leah was not loved and thus she was very willing to bear children to her husband (Gen 29:31-35). This would help explain why she bare 7 children to Jacob within a rather short period of time, within 7 years. Indeed, Joseph was the last son that was born to Jacob in Padan-aram, and as indicated above, Joseph was born after Jacob spent 14 years with Laban. Thus, excepting Benjamin, all children of Jacob were born within an interval of approximately 7 years. Allowing no less than 10 months between the conception of two successive children, Leah had 70 months available, that is 5 years and 10 months, which would fit well within the 7 year period. Moreover, there must have been some overlap between the pregnancies of Leah, Rachel, and the two concubines of Jacob. Rachel was the last to give birth. The calculations above could be verified as follows. The Israelites were 430 years in Egypt (Ex 12:40). Moses was 80 years old when he spoke to Pharaoh (Ex 7:7). Thus, Moses was born after Israel was 430 – 80 = 350 years in Egypt. The father of Moses, Amram, lived 137 years (Ex 6:20). It follows that Amram had to be born no earlier than about 350 – 137 = 213 years after Jacob came to Egypt. The father of Amram, Kohath, lived 133 years (Ex 6:18). It follows that Kohath had to be born no earlier than about 213 – 133 = 80 years after Jacob came to Egypt. Therefore, Levi, the father of Kohath, must have been at least 80 years in Egypt. Now, Levi lived 137 years (Ex 6:16). It follows that Levi immigrated to Egypt when he was no more than 137-80 = 57 years old. Levi was the third son of Jacob and Leah. Since Leah bare her children in a rather short time interval, Levi must have been born approximately 3 years after Jacob married Leah. This would imply that Joseph was approximately 4 years younger than Levi. Indeed, after Joseph was born, Jacob asked Laban for permission to leave, which implies that this happened after the 14 years in which he paid for his wives. At that time he had been married for seven years, so the difference of age between Joseph and Levi must have been of about 4 years. Thus, since Joseph was about 39 years old when Jacob came to Egypt, Levi must have been about 43 years old at that time. This age satisfies the constraint derived above that Levi was no more than 57 years old when he moved to Egypt. After Joseph was taken to Egypt, “Judah went down from his brethren” (Gen 38:1) and got three sons by a Canaanite woman: Er, Onan, and Shelah (Gen 38:3-5). “And Judah took a wife for Er his firstborn, whose name was Tamar” (Gen 38:6). Er and Onan died young. “Then said Judah to Tamar his daughter in law, Remain a widow at thy father’s house, till Shelah my son be grown: for he said, Lest peradventure he die also, as his brethren did” (Gen 38:11). Then, the wife of Judah died (Gen 38:12). Then, Tamar, as “she saw that Shelah was grown, and she was not given unto him to wife” (Gen 38:14) disguised herself into a prostitute and managed to get pregnant by her father-in-law Judah (Gen 38:14-18). Then Judah found out (Gen 38:24-26). Later, Tamar gave birth two twin brothers: Pharez and Zarah (Gen 38:29-30). The events of Gen 38 take place between the time Joseph was taken to Egypt and the time Judah moved to Egypt. While it is possible that the birth of Pharez and Zarah took place in Egypt, it is clear that all preceding events took place before Judah moved to Egypt. At the time of Gen 37:2 Joseph was 17 years old. Assuming that he was still 17 years old when he was taken to Egypt, since he was 39 years old when Jacob moved to Egypt, it follows that the events of Gen 38 took place within a period of about 22 years. This would imply that Er married at a young age, most likely before he was 20 years old. Note that Judah, as the fourth son of Jacob, must have been about 3 years older than Joseph. Then, Judah must have been about 20 years old when he married. A four year difference between Joseph and Levi would imply that Benjamin was very young when Joseph was 17, for the birth of Benjamin is mentioned in Gen 35:18, after Simeon and Levi killed the men of Shechem (Gen 34:25). Now, Joseph said in Gen 45:12 that Benjamin could recognize him. Joseph was taken to Egypt when he was about 17 years old (Gen 37:2). If we assume that Benjamin was 4 years old at that time, it would follow that Benjamin was born when Jacob was about 104 years old. Rachel died when she gave birth to Benjamin, about 27 years after Jacob met her. At the time when Jacob went to Egypt he had 70 descendants (Ex 1:5, Gen 46:27). Additional information about these descendants is found in Gen 46. At a first look, it may appear that Gen 46:8-27 names descendants of Jacob that were born before he moved to Egypt. At a closer examination, however, it can be seen that the passage does not state that all of them had been born by the time Jacob went to Egypt. Examining Gen 46:8-27, we can see that this passage is about the twelve sons of Jacob. It names the twelve sons and some of their descendants, and provides information about the number of descendants at the time when Jacob moved to Egypt. The passage is not about the descendants of Jacob who went with him to Egypt, but about the twelve sons of Jacob. One way to see this is by looking at verses 8 and 15. Verse 8 introduces the passage with the words “And these are the names of the sons of Israel who came into Egypt … “Darby. Then, following a text naming the sons of Leah and some of their descendants, verse 15 states “These are the sons of Leah, whom she bore to Jacob in Padan-Aram … “Darby. Since the sons of Leah were born in Padan Aram, while their children were not born there, it is clear that the text is not about the descendants of Jacob, but about his sons, though the text mentions also descendants of his sons. But why would a passage about the names of the twelve sons speak also about their descendants? The twelve sons of Jacob must have been known not only by their own names, but also as fathers of some of their more notable descendants. Apparently, male descendants were typically remembered. Indeed, the only women mentioned by name in this passage are Dinah the daughter of Jacob (Gen 46:15), Serah the daughter of Asher (Gen 46:17), and the wives of Jacob. At the time when Jacob moved to Egypt he had both male and female descendants, for we read about “his daughters” and “his sons’ daughters” in Gen 46:7. Daughters are mentioned also earlier in Gen 37:35. Not all female descendants are mentioned by name, for we find the plural “daughters” in Gen 46:15, though Dinah is the only woman mentioned by name among the descendants of Leah. Moreover, in Gen 46:7 we find again the plural “daughters” in “son’s daughters”, though Serah is the only daughter of the sons of Jacob that is mentioned by name. Thus, we can conclude that not all female descendants were named. Now, given the context of the passage, the 33 sons and daughters of Jacob in Gen 46:15 were the descendants of Leah who were living when Jacob went to Egypt. Since Gen 46:15 states explicitly that the number of descendants of Leah included both sons and daughters, we infer that the same is true for the number of descendants of the other wives of Jacob in Gen 46:18,22,25. Adding together the numbers in Gen 46:15,18,22,25, we obtain 33 + 16 + 14 + 7 = 70 sons and daughters. Indeed, as noted earlier, when Jacob went to Egypt he had 70 descendants (Ex 1:5, Gen 46:27). Now, only 66 of them went with Jacob to Egypt (Gen 46:26). Assuming that the remaining descendants were from the family of Joseph, this would imply that Joseph had also a daughter, to account for the difference of 70 – 66 = 4, the difference consisting of Joseph, his two sons, and his daughter. While the number of female descendants of Jacob is not mentioned, if we would assume that about half of the 70 were male, it would follow that approximately 35 of the descendants named in Gen 46:8-27 had been born by the time Jacob went to Egypt, while the others were born later. It is also possible to see that Gen 46:8-27 does not name the 70 descendants of Ex 1:5 and Gen 46:27 if we count the names. Note that Gen 46:8-27 names 71 descendants: from Leah 34 descendants (Gen 46:8-15, counting also Dinah), from Zilpah 16 descendants (Gen 46:16-18, counting also Serah), from Rachel 14 descendants (Gen 46:19-22), and from Bilhah 7 descendants (Gen 46:23-25). Two of the descendants mentioned in Gen 46:8-27 were already dead (Er and Onan, the sons of Judah), so 71 – 2 = 69 persons remain. If we assume that approximately half of the 70 descendants were male, it would follow that approximately 35 out of the 69 were alive at the time when Jacob went to Egypt, while the others were born later. The conclusion that some of the persons mentioned in Gen 46:8-27 were born later is consistent with the observation that only two of the fours sons of Reuben (Gen 46:9) had been born by the time of Gen 42:37. Note that Gen 42:37 did not take place a long time before Jacob moved to Egypt.